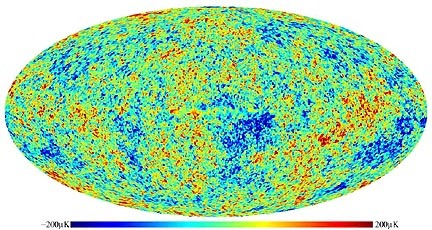 The Wilkinson Microwave Anisotropy Probe's first detailed map of the oldest light in the universe. Cosmologists call it a "baby picture" of the universe. Colors indicate "warmer" (red) and "cooler" (blue) spots. The oval shape is a projection to display the whole sky; similar to the way the globe of the earth can be projected as an oval. The microwave light captured in this picture is from 379,000 years after the Big Bang, over 13 billion years ago. Source: WMAP NASA. Next PostNext Part 1 – What Does NASA Know About 1965 Aerial Vehicle Crash in Kecksburg, Pennsylvania?